Founded in 1985, Aviara Animal Health Center has grown to become a mainstay for pet owners in Carlsbad, Oceanside, Encinitas, Cardiff, Escondido, Vista, and throughout Northern San Diego County. 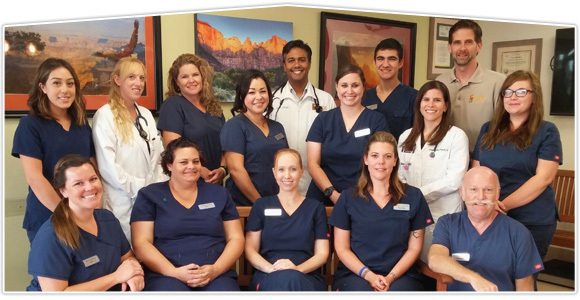 Under the ownership of Dr. Ben Singh (he became the practice's third owner in August of 2010) this Carlsbad veterinary hospital has built on its reputation for quality care and client service. We have also expanded the resources of the Carlsbad veterinary facility to include state-of-the-art computerized full-body and dental X-rays, modern lab equipment, ultrasound technology, and computerized medical records. In all, these advancements have placed us at the leading edge of modern veterinary medicine. What this means for you and your pet is the ability of our Carlsbad veterinarians to heighten our focus on preventative medicine. As medical professionals, we understand that the best means to protect your pet's health and well-being is through the well understood principles of preventative veterinary care. This means that we highly recommend your pet receive regular wellness exams, appropriate vaccines, microchip ID in case he or she becomes lost, nutritional and behavioral counseling, and internal and external parasite preventatives. Preventative veterinary care also includes understanding that our clients are oftentimes our friends and neighbors and that we all share a love for companion animals. We respect your opinions and concerns and strive each day to create an atmosphere within our practice that is as welcoming and friendly as it is professional. During routine visits we will also work with you to ensure you are providing the best and most up-to-date care for your pet in your home. This includes feeding and nutritional strategies, house training advice for a new puppy or kitten, and methods to prevent internal parasites as well as fleas and ticks. When all of these efforts are taken as a whole, they become a very effective and manageable preventative care strategy. Additionally, not only will you be giving your pet the best chance of living a long and healthy life, but working to minimize the lifetime cost of care by preventing the need for costly medical interventions. We also understand that accidents and illness will happen even to the healthiest of pets. The skill and expertise of our veterinarians is enhanced by modern diagnostic imaging equipment, in-house medical testing capabilities, complete surgical suite, and wide range of internal medicine expertise and resources. In all, our Carlsbad veterinary hospital is committed to providing the highest quality of care for your pet by staff that is courteous and friendly, in a facility that is comfortable, safe and convenient. We don't want to be just your veterinarian, but a good friend and neighbor as well. Please take some time to look around our website and then give us a call to set up an appointment today!